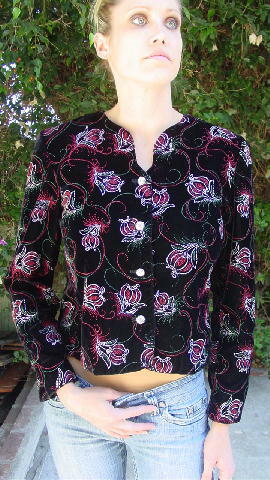 This 80% acetate and 20% nylon vintage evening jacket is a Norton McNaughton Petite and was made in the USA. 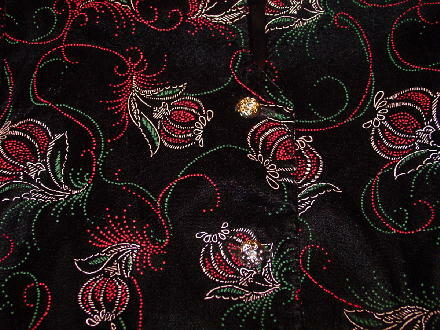 It has a black velvet background with a green and red painted dot and silver cord design pattern. 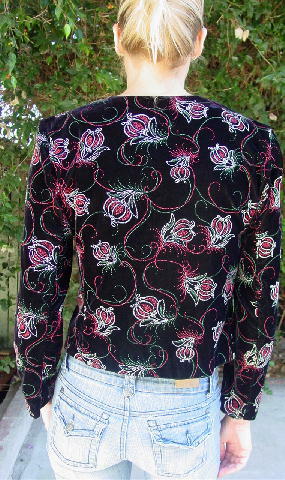 There are four silver-tone textured buttons down the front, long sleeves, and a jewel neckline with a little 3" deep wide V cutout. The tag says 8 P, but it fits more like a 4 Petite. bottom hem side to side 17 3/4"
armpit to armpit 18 7/8"